Harborough Town boss Nick Pollard boss has snapped up striker Kevin Byrne and brought Alex McMillan back to Bowdens Park. 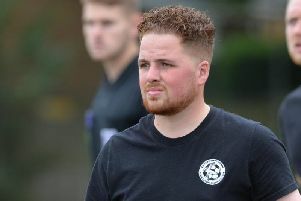 Ex-Corby marksman Byrne is on the way back from a knee injury that ruled him out last season and McMillan rejoins his home-town club after playing four games in the Rothwell Corinthians side that were promoted to the UCL Premier Division last season. McMillan was also part of the squad that took the Bees into the Premier Division in 2010/2011. He came on for the last 20 minutes of the 2-1 defeat against Blaby & Whetstone in the Bees’ latest pre-season friendly. Byrne also featured in the match - and Pollard explained what the 32 year-old brings to the side. He said: “Kevin brings a lot of experience to the pitch and the dressing room. “He knows how to nick a tight game 1-0 and that’s priceless. We need that sort of experience. “I didn’t want to make too many changes to last season’s squad, but felt we needed more competition for places. “Players need to know that if they’re not performing, they won’t keep the shirt. Byrne comes up against his former club when Corby Town visit Bowdens Park for a prestigious pre-season friendly on Tuesday night (7.45pm). The Steelmen were promoted to Conference North last season and look set to send a strong squad to Harborough, including ex-Football League players Chris Carruthers, who played as a junior at Harborough, and Spencer Weir-Daley. Weir-Daley played for Nottingham Forest and Notts County earlier in his career and this year played for Montserrat in World Cup qualifying fixtures.